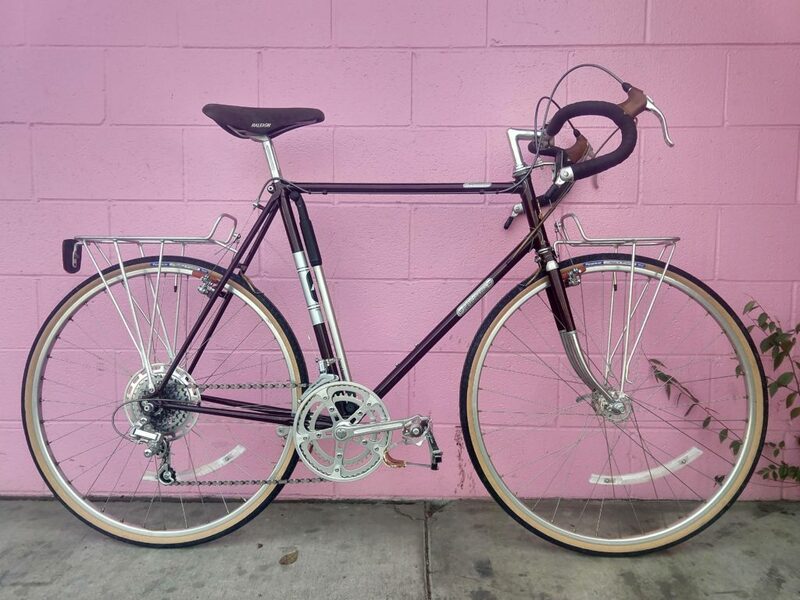 Our featured bike for December bestows “Raymond’s style without Raymond’s attitude.” This Japanese-built early 80s Raleigh Touring 14 was near top-of-the-line in its day, and still in incredibly good condition. It is a sensible sport touring bike with comfortable & stable geometry, 14-speed wide ratio gearing, light & rigid front & rear racks, and Sun Tour VX equipped. Modern touches—like new Kool Stop brake pads on original Dia Compe cantilevers, hardy Panaracer Pasela tires on stock Araya 700c alloy rims, and perfectly matched sticker-flickers—update the performance whilst staying era appropriate. 58cm (c-c) seat tube, 56 (c-c) top tube: this fits a tallish rider, 5’10”-6′, who’s looking to spend $400 and then hit the open road.